They call it the blues but the music often raises one's spirits rather than lowers them, and such was the case Sunday at the third annual Blues, Views and BBQ Festival. Fairfield resident Lyn DiScala, who attended the festival with her daughter Dana, said, "I wasn't planning to dance but I couldn't help getting out of my seat." 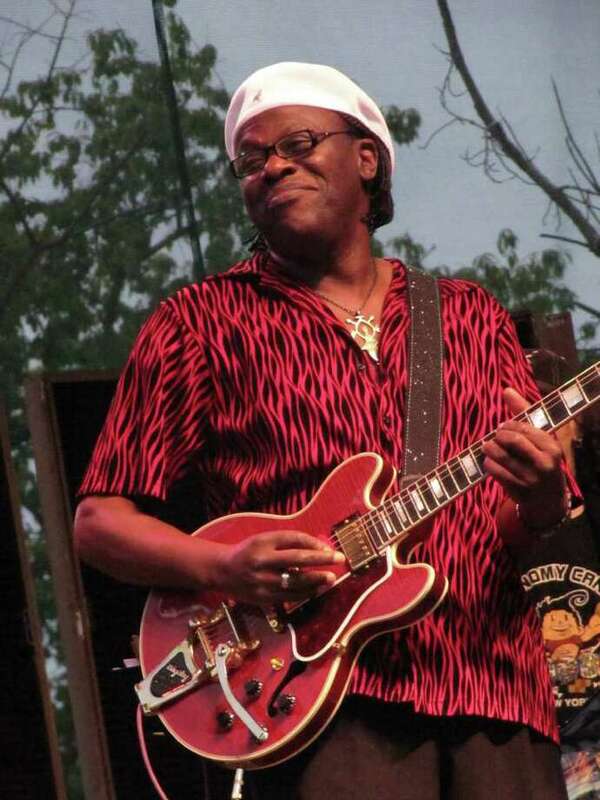 Sunday's performers included the Uptown Horns Revue, Christine Ohlman, Debbie Davies, Junior Mack and Joe Louis Walker, who was recently named the winner of the 2010 Living Blues Awards, Critics' Poll as "Most Outstanding Musician (Guitar)." After Walker's set ended and the crowd called for an encore, the lights went back on. Walker was not alone. He, Davies, Ohlman, Mack and the Uptown Horns Revue gave the crowd that stayed until the very end a fabulous version of soul duo Sam & Dave's "Hold On, I'm Comin'"
"It's important for people to come out and support roots music, because popular music, they promote that so much," said Walker. "But this, you've got to search this music out. It's the roots. It's like the lining of a coat. They put some fancy colors on the outside, some fancy designs, but the lining is [the] basic thing that holds the coat together, and the blues is like the lining." Not counting the group of people dancing near the front of the stage, Westport's concert-goers were more relaxed than other crowds Davies has played in front of. Even so, Davies said she could tell they were totally into it. "You can feel it," she said. Whether they were dancing or standing, DiScala told the Westport News she loved "the cast of characters all around." "It was so diverse," she said. "It was 360 degrees of characters and that's what I loved about it." The third annual Blues, Views and BBQ Festival was presented by the Westport Downtown Merchants Association at the Levitt Pavilion for the Performing Arts, on Saturday and Sunday. The festival actually kicked off Friday night with a performance by the Blus Traveler. Twenty-one-year-old Joe Magrath, an employee of Bobby Q's, one of the main sponors, said the festival allows everyone to "see our quiet little town and listen to some good music," and show that "Westport can actually be a lot of fun." Westport resident Matt Winthrop, who plays piano and guitar, brought his two twin nine-year-old daughters daughters with him. He attended the festival both on Saturday and Sunday. Asked what day was better, he said, "Yesterday was sunny but the music's a little better today." Winthrop said the festival is great in that it also had activities for children -- face painting, inflatables for bouncing, a mechanical bull, magicians and balloon artists, for example -- and also BBQ food, which he is a fan of almost as much as music. In addition to the food for sale, the festival also featured BBQ contests. "You can see how real professional smoked meat and barbecue guys do it," Winthrop said. "How they start it, how they present it. It's more than just buying food." A stock broker in Stamford by day, Winthrop said he hopes to start a blues/rock band in the area in the near future. If he can't find anyone, he may have to recruit his daughters Sydney, who is learning guitar, and Jennifer, who is fine-tuning her skills on piano. Winthrop joked that he has another goal. "I want to emcee this thing next year," he said. "They don't have an emcee. They need someone like me, with energy." If there were characters at the festival, then two of the most popular were Jake Molwitz and Pat Dougherty, who perform as Jake and Elwood from the Blues Brothers movie that fetaured John Belushi and Dan Akroyd. They didn't play the main stage. Rather, they entertained against the backdrop of the Blues Brothers cop car -- with an oversized horn on the roof and all -- amidst the family and kids' activities that took place in the parking lot adjacent to the pavilion. Occasionally they walked around and, wherever they went, the sunglasses-sporting duo was besieged for photo-ops. "We've been living this for the past third of a century," Dougherty said. He added that more people seemed to stop and listen to them at Blues, Views and BBQ than when they perform at car shows and other festivals. "It just makes you feel good," he said. Norman Francis, who was working inside Winnie's Jerk Chicken & Fish truck, didn't play an instrument throughout the weekend, but he was feeling good. Sales were steady all weekend and all day Sunday for the Hudson, N.Y.-based business. He estimated that he probably had 200 jerk chicken orders on Sunday alone, and that was well before the night was through. It was his first time at the blues festival. "The people here are very decent," Francis said.